This is the gift that we put together for my nephews for their birthday in early December this year. They are two years apart and we felt that both were of appropriate age for an adventure kit. 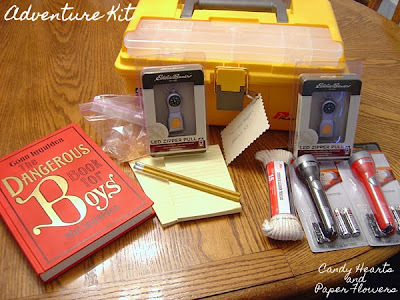 We included a compass and flashlight with a notepad and pencil for each of them. A length of rope that they can use to practice their knots, and the book The Dangerous Book for Boys . They both have pocketknives already, so we didn't include those. We also included a box for them to hold all of their adventure gear. The baggies hold some homemade cherry hard tack candy bits for them to enjoy on their adventures.